Posted 8 January 2011 in Bonus, Cooke Looks, The Forever People #3. A few of my insights about this issue are featured in the “‘S’ is for Scapegoat” entry but allow me to again marvel at what a turning point this was for the Fourth World and for me, as a young reader experiencing the comics as they appeared on the stands. Jack Kirby has this incredible ability to not only convincingly depict the most cosmic, outer-worldly and fantastical happenings but to simultaneously convey them as relevant and pertinent to real life. His and Stan’s use of New York City as a setting for the Marvel super-heroes was a stunning development connecting not only The Mighty Thor and Ben Grimm together, but it linked we, the readers, with the characters as well. And while he and Joe Simon were likely not the first to use the real-world menace of Adolf Hitler and his Nazi regime as foils for costumed characters, the Fuhrer’s villainy in Captain America Comics gave the character and his exploits an invigorating urgency in a worldwide battle we were a part of as well. But starting here, in The Forever People, Jack was bringing relevancy to an entirely new level, giving us a profound statement, in the guise of “good” New Genesis and “bad” Apokolips, the yin and yang of human nature writ large, with direct allusions to the horror of the real Holocaust, the threat of technology in dehumanizing us, and how we all can fall victim to our prejudices and selfishness. There’s also a statement here not only about fascism and race-hatred, but about the risks posed by silky smooth evangelists selling a gospel of death… I mean, there’s a lot going on in this issue, even if a few plot threads here and there seem to evaporate (though I’m confident had the series continued to its rightful ending, some matters would be cleared up). Among the unanswered questions that arise: How precisely did Godfrey attract the discontented recruits and what was his specific criteria? Who were the persecuted folk being captured and what set them apart from the Justifier recruits? Why were they kidnapped and — maybe I’m missing something — what use did they have for Desaad in locating the Anti-Life Equation? Their cries of despair are filtered into peals of laughter… is this just a sick amusement for Desaad? Frankly, these questions only make the Fourth World all that more appealing — alluring, if you will! And the only negative comments I can conjure are simply a couple of disappointments: The disappearance of The Infinity Man for the duration of the series, except for the last issue; and the relative vanishing of Glorious Godfrey, hand’s down my favorite of Darkseid’s elite. Of all the villains populating the court of Apokolips, Godfrey knows human beings and is potentially the greatest threat short of Darkseid himself, as he wields a marketing savvy and psychological insight that rivals Madison Avenue! Simply a profoundly great issue! And, believe it or don’t, The Forever People even gets better as we enter the “Happyland Affair”! I assume that the people that the Justifiers rounded up were taken to Happyland to be fodder for Desaad’s “amusements” (e.g. the trapped people inside the cartoon statues at the beginning of The Forever People #4, whose screams are scrambled into laughter for the benefit of Happyland’s patrons). Glorious Godfrey was certainly a satisfyingly reprehensible bad guy, and one who seems even more relevant in the present cultural and political climate. Just goes to show you what classic stuff the King’s work is. I’m looking forward to seeing what you have to say about another of Jack’s creepiest and most inventive heavies, Doctor Bedlam in Mister Miracle. I, too, found it disappointing that The Infinity Man almost completely drops out of the saga as of this issue. One of many reasons I would have liked to see it all play out as Jack intended is to see — I would hope — the origin of The Infinity Man as Jack conceived him. 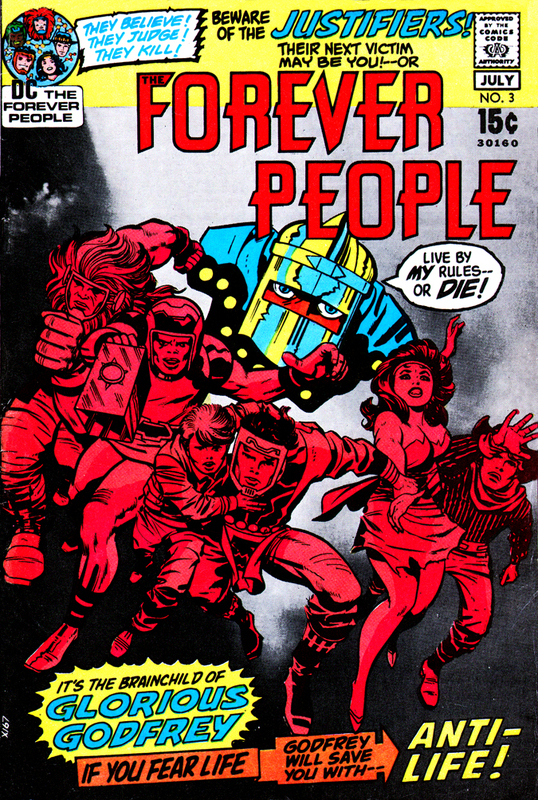 The Forever People #11 makes clear that he is a separate being from them, and not an amalgam of them. I wish we could have learned where he came from, in Jack’s actual concept. One of my favorite lines in the entire Fourth World saga is in this issue, spoken to Desaad by our master villain: “When you cry out in your dreams, it is Darkseid that you see!” Chilling.